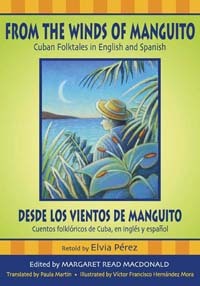 Desde los vientos de Manguito: Cuentos folklóricos de Cuba, en inglés y español. Playful folktales from Cuba, many with singing refrains. Tales from both Hispanic and Afro-Cuban traditions. Retold by Cuban storyteller, Elvia Pérez. Translated by Argentine teller Paula Martín. Texts in both English and Spanish. Great intro to Cuban folklore, plus some really fun-to-tell stories here!